Our subsidised memberships are allocated based on current Ofsted rating or school status and provide your school with a suite of resources to support your safeguarding provision. 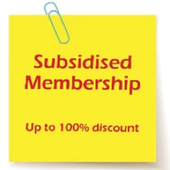 Find out more about subsidised membership and discover what discounts you may qualify for. Please note, by using a discount code, you are confirming that you qualify for the related scheme. All orders will be validated - any schools using a code which they do not qualify for may be invoiced at full membership price.